Learn How to Say How Are You in Chinese As Natives Speak It Everyday! Last time we have learned how to say Hello or Hi in Mandarin Chinese and as a follow up lesson we should learn how to say “How Are You” in Mandarin. There are many ways that natives use the language to constantly come up with variations and because this language is always evolving, there might be time in the future that none of these will be used. this one is the most common way to ask someone how are you. You will see it in every Chinese learning book. Many people are saying that no one in China is using it, but its not true. I have heard it many times. Yes, between friends and family members, there are many other ways of saying this, but as a foreigner, you can never go wrong with this one. Also in China especially, you should use formal way 您好吗？ — to ask elderly person or someone who has higher rank than you out of respect. Its the same as whenyou simple greet them Hello, in Chinese. This expression litteraly means — “Your body good?”, meaning how are you or how is your body doing. For some reason I see this in couple Mandarin textbooks, but I have never heard it personally in real conversation. But I still think its worth learning it, because it makes you to remember the word 身体 – body in a sentence and reinforces the question particle 吗 in your brain. So everytime you hear it at the end of the sentence, you will know instantly that the person you speaking with is asing you a question. This phrase can be loosely translated to English as “How you doing?” … I have heard this so many times and I believe its the most common phrases to ask someone “how are you” in Mandarin. And I really love the sound of it, so I use it the most. Using the base of the previous question and adding the word 最近 – recently, you will form another popular way of asking: “How have you been lately”, which you will hear also a lot. By combining “你好吗？” and “你最近好吗？”, you get this phrase. Its just that I want to show you that no phrase is set in stone in Chinese language, so you just need to sometimes use a little bit of creativity to get your ideas accross. But as soon as you start getting certain patterns in the language, it will flow naturally. And please, this does not mean the speaker is trying to invite you for a lunch and also he does not want to know what tyoe of food you have eaten. This phrase comes from the social behavior of Chinese people, since the food is really part of their culture. When I heard this for the first time, I had no idea how to reply to that person. Actually I tought that my friend is inviting me to eat. Ok, so you now get some ideas of how you can say “how are you” in Mandarin. Try to really memorize these phrases by heart. Its not that difficult. Now, you still have to learn some responses you might hear or you want to say to the person asking you these questions. 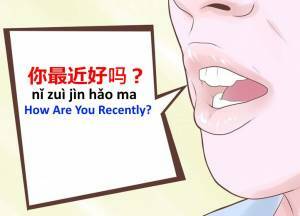 How to Respond to How Are You in Chinese? 1. 我很好，谢谢。 <Wǒ hěn hǎo, xièxiè.> – I’m fine, thank you. 2. 还可以。 <Hái kěyǐ.> – Not bad. 3. 不错。 <Bùcuò.> – Not Bad. 4. 不好。 <Bù hǎo.> – Not Good. 5. 不太好。<Bù tài hǎo.> – Not very good. 1. 我很忙。 <Wǒ hěn máng.> – I am very busy. 2. 我不舒服。 <Wǒ bú shūfú.> – I am not feeling well. 3. 我病了。<Wǒ bìngle.> – I am sick. 4. 我很累。<Wǒ hěn lèi.> – I am tired. Please understand that more you learn Chinese, more ideas you will get about how to ask “How are you” in Mandarin and you will also be able to construct answers to these questions on the fly. Also its completely correct if you answer the question and ask the other person about how they are doing and to do so, you simple add 你呢？- nǐ ne? – after you finish with your answer. A.你怎么样？<Nǐ zěnme yàng?> – How are you? B. 我很好，你呢？<Wǒ hěn hǎo, nǐ ne?> – I am good. What about you? A. 我不太好。我病了。<Wǒ bù tài hǎo. Wǒ bìngle> – I am not that good. I am sick. Now, if you want to really start learning Mandarin Chinese and do not want to waste much time and money at school, just check out my article about the 6 tools that you must have when learning Mandarin Chinese. They are the ones that I use on daily basis and maybe I would give up long time ago, if I would not have them. So you can learn Chinese smart way, not the hard way like most people.